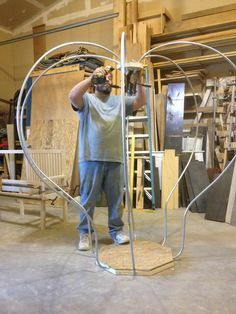 How to make a large carriage out of pvc pipes? 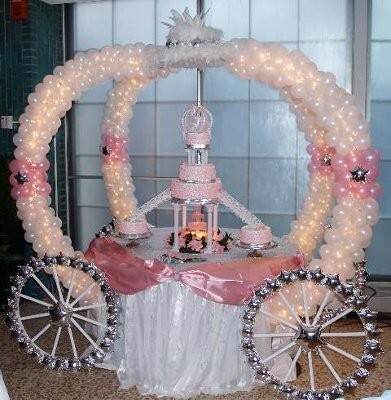 My fiancée and I are getting married and we would like to create a large carriage for our "Cinderella" inspired theme. We have attached pictures of how we would like it to resemble. PVC pipes are what we are looking to use as the primary material, along with additional necessities. We don't know what to use to bend the pipes to the desires shape. Is there something else more useful for this type of project? If anyone could help with this question, it would be appreciated. Thank You! Congratulations MrsNum1. Welcome to the Community! I think you could use 1/2" or 3/4" PVC pipe for the skeleton of this carriage. It will take some practice using a heat gun and leather gloves to get the bends just right. I would consider filling the pipes with sand before bending to prevent kinks. Do this work outside so you don't inhale any fumes. I don't think that PVC was used in the picture on the left though. It looks to me like 1/2" EMT conduit. EMT is a thin metal pipe that is bent with a, (surprise! ), conduit bender. It will keep its shape well and is a much simpler process than trying to heat and bend plastic. EMT is what I would use. You can find the conduit here. The conduit bender is here.